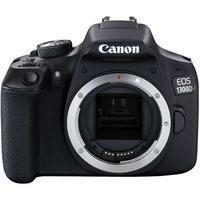 The EOS 1300D from Canon is an entry-level DSLR that replaces the 1200D in Canon's EOS model line-up. Aimed at beginners and photography enthusiasts who wish to take their hobby to the next level, the 1300D is an 18-megapixel camera with Wi-Fi connectivity, a 9-point AF system, Full HD video recording and up to 3fps continuous shooting. Containing all of the technology essential to DSLR photography but in a lightweight body, the EOS 1300D is the ideal choice for those who wish to shoot straight from the box using a simple yet feature packed DSLR that yields extraordinary results.